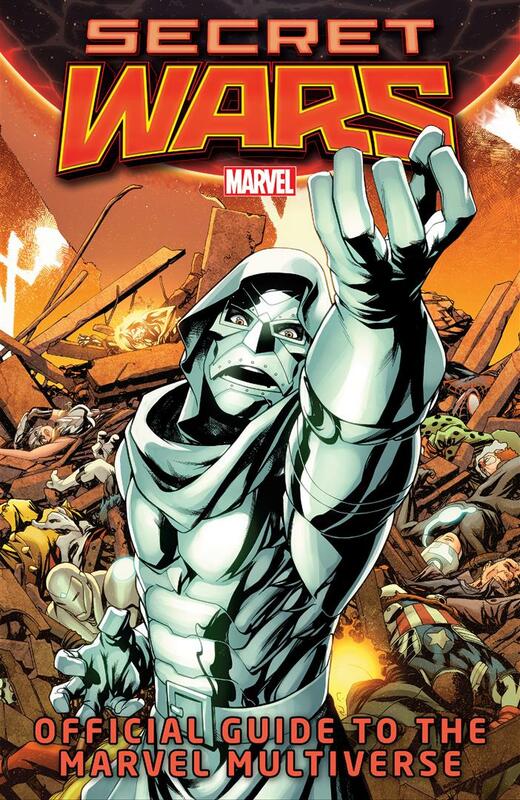 A helpful handbook for people who skipped Secret Wars 2015 but want a quick guide to what happened. 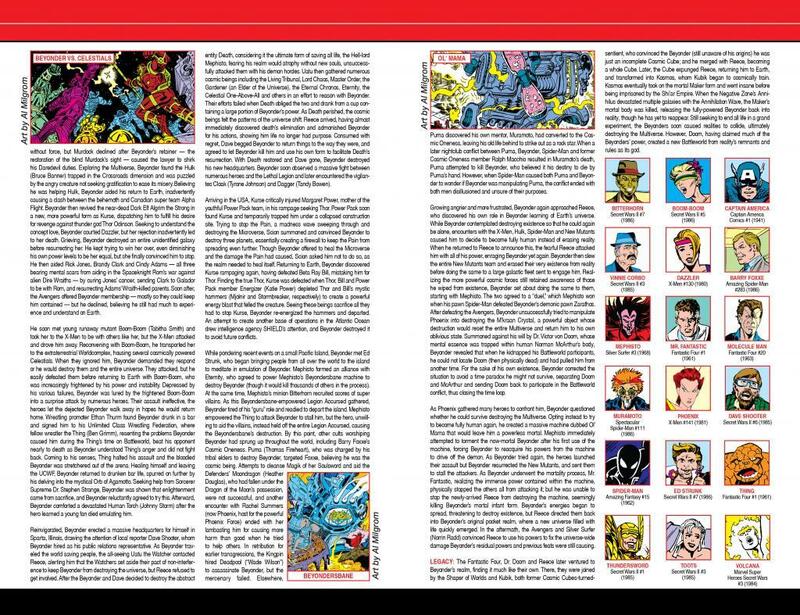 Battleworld, with the regions all getting a paragraph. 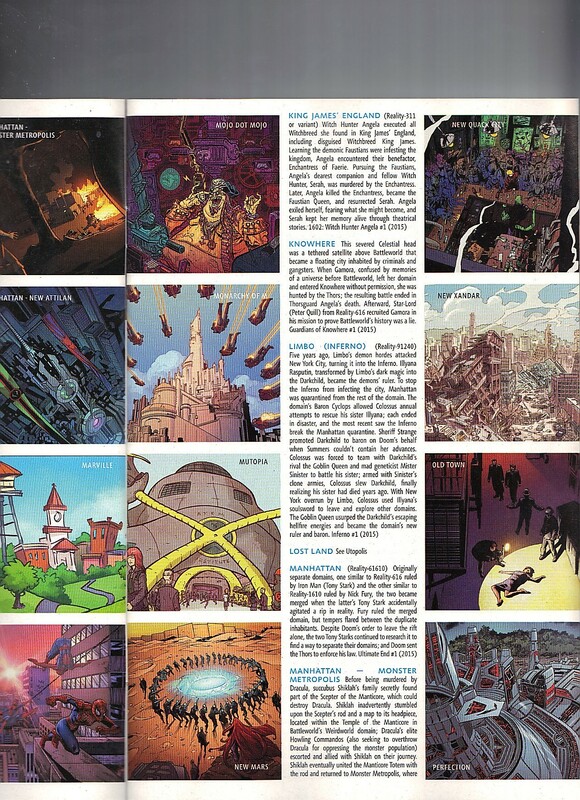 Limbo from the Inferno series, Manhattan from Ultimate End and Marville of Giant Size Little Marvels are seen. This page has the paragraphs regarding Limbo and Manhattan. Sentinel Territory of Years of Future Past and The SHIELD from The SHIELD are seen. 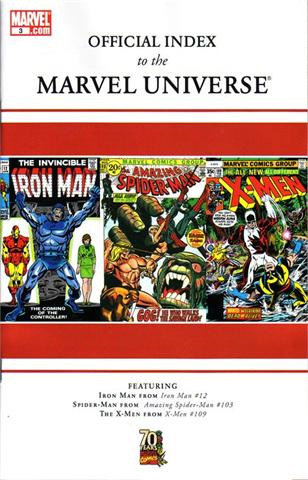 This page also has Marville’s paragraph. 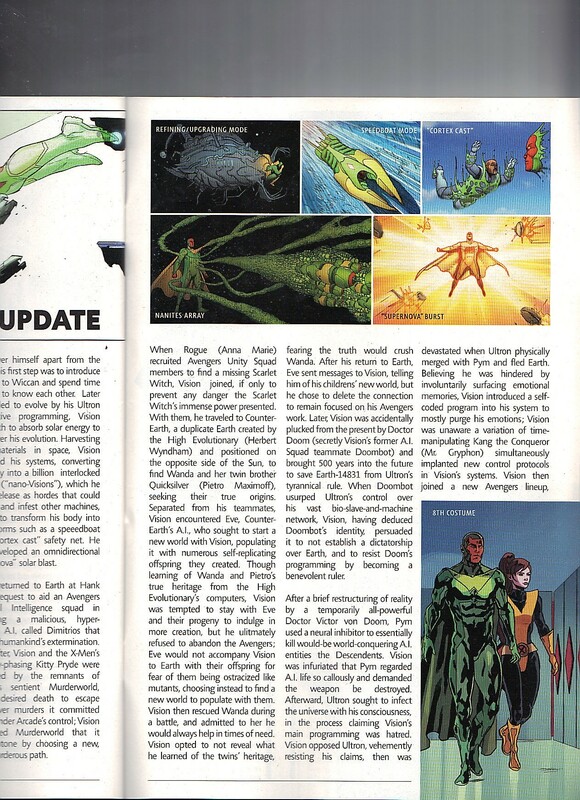 This page has paragraphs for Sentinel Territories, The SHIELD, Wastelands and X-Topia – Genosha and X-City from X-Tinction Agenda. Vision and Kitty’s adventure from A+X 18 is summarized. We see Kitty and Vision, in only his eighth costume. Wolverine (X23 Update) gets the final profile. My heart goes out to Daron Jensen, over the lost of Arthur, as that is simply heart breaking! 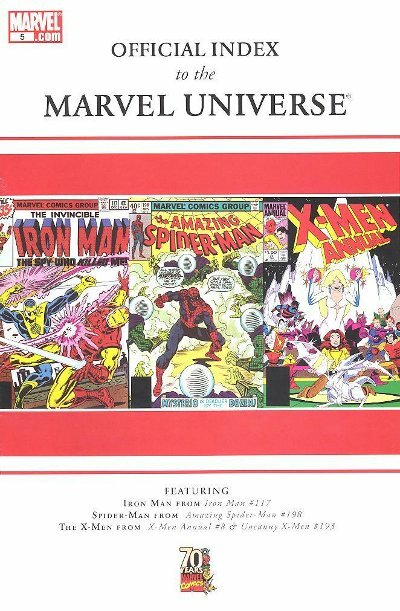 Nice that the late Alan Kupperberg’s creation gets a spotlight. 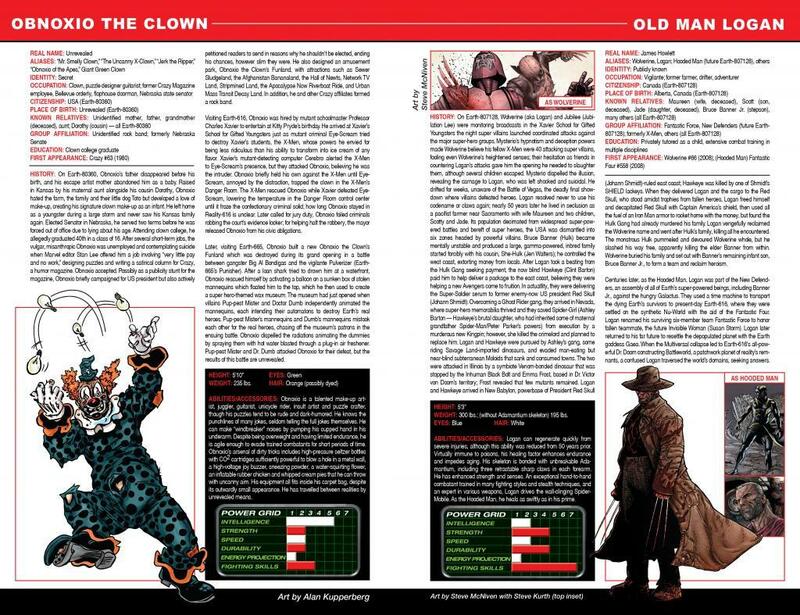 Kitty isn’t mention in the Old Man Logan spotlight. 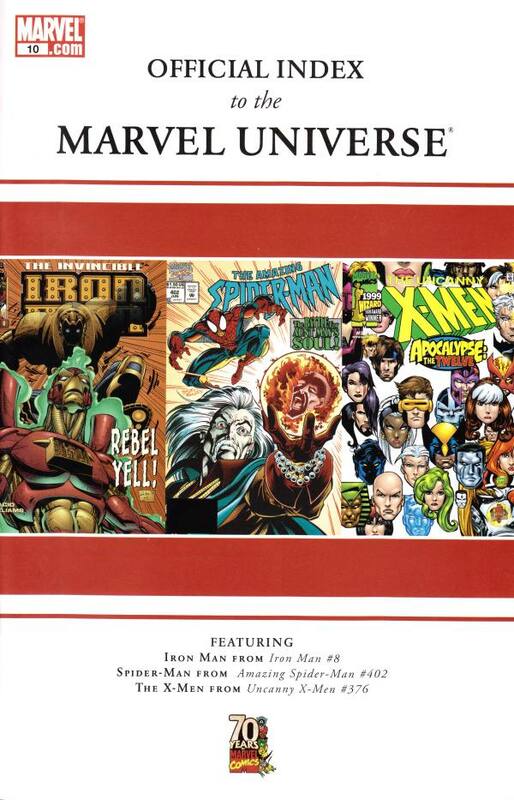 In my mind, Secret Wars II has a lot to do with the X-Men and the New Mutants but the event was much larger than that. The New Mutants were really affected by the event. Nice that Magik gets name checked in it. 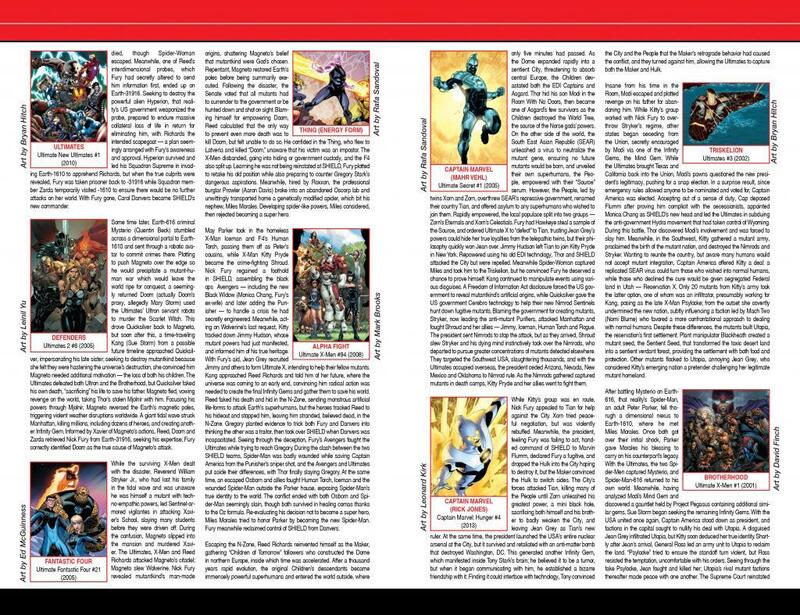 Miles time with the All New Ultimates, which also had Ultimate Shadowcat as a member, gets spotlighted. 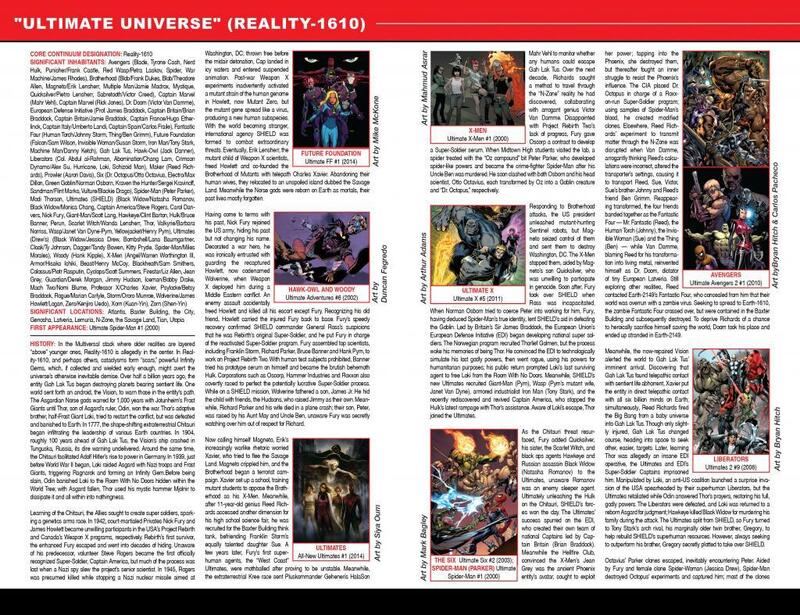 Really surprised that the entire Ultimate Universe can be squeezed down to five pages, especially with the lack of crossovers (at first). 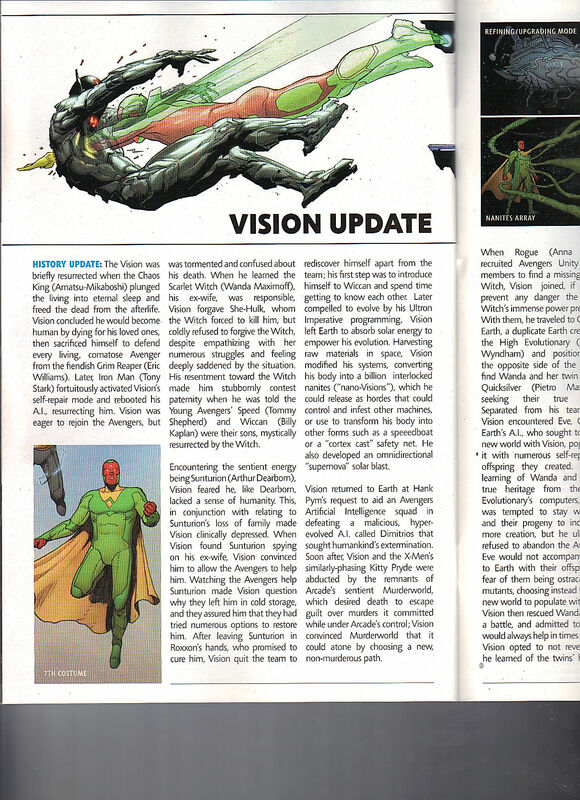 Glad to see the green dragon from Secret Wars has an official name. I want to say she got the name in Shadow and Flame, but I’ll find out when I reread that series – someday. Also nice is that she doesn’t have any other adventures that I have to track down. 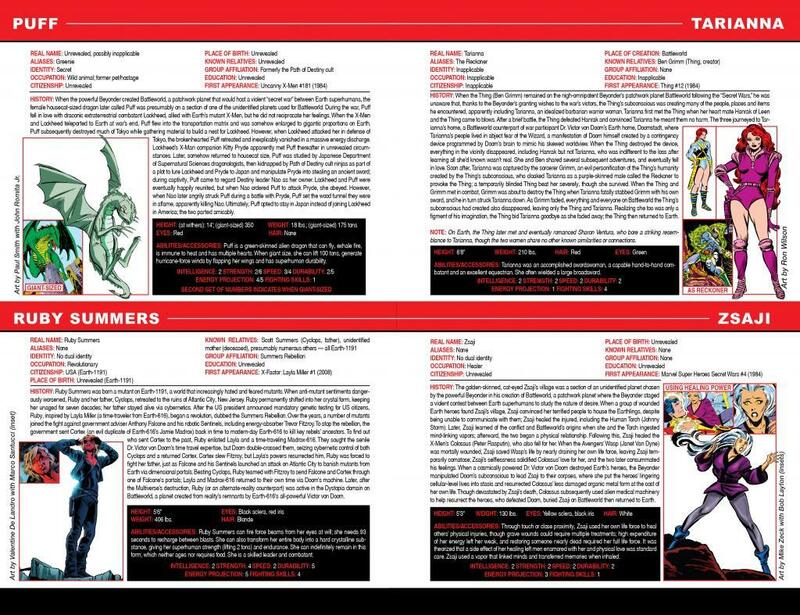 I like how in Zsaji’s spotlight, Colossus cheating on his then girlfriend, isn’t mention. That should be in his spotlight. Zsaji’s entry shall be her heroic sacrifice. Nice to actually read about Ruby Summers, as I’m not going to seek out those X-Factor issues. 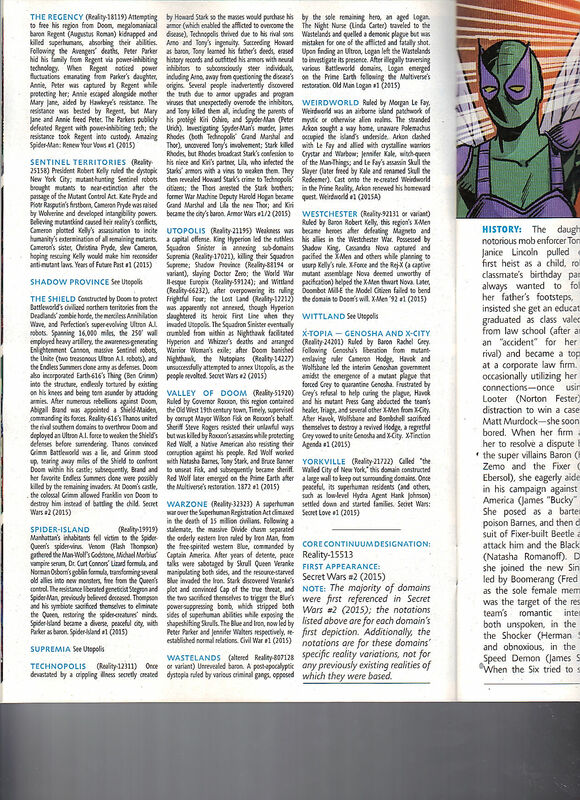 Children of the Secret Wars, from the amazing What If 114 issue. Apparently they showed up in another issue, which I wish was revealed in this issue. 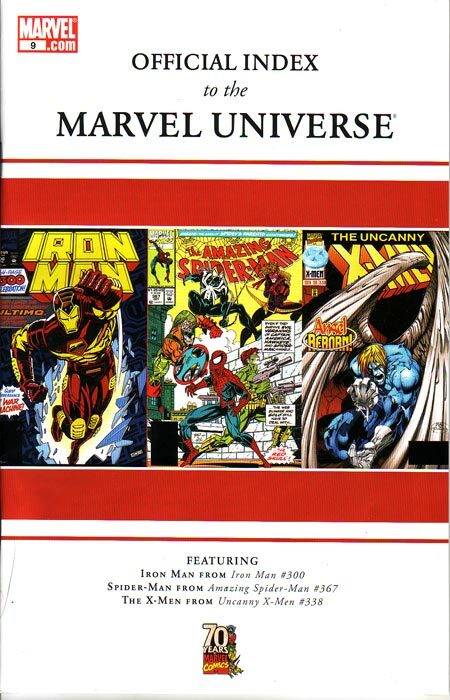 Apparently Avengers Forever 11 and 12, had an appearance by a few of these kids, I wonder if I picked up on that, when that issue came out. 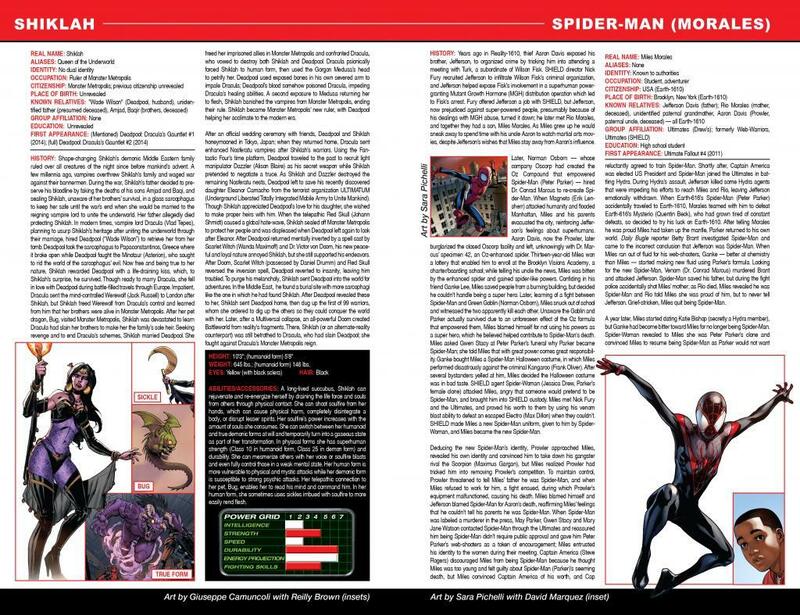 Egyptia is a region of Secret Wars 2015’s Battleworld, so it is nice to read about the proper version. 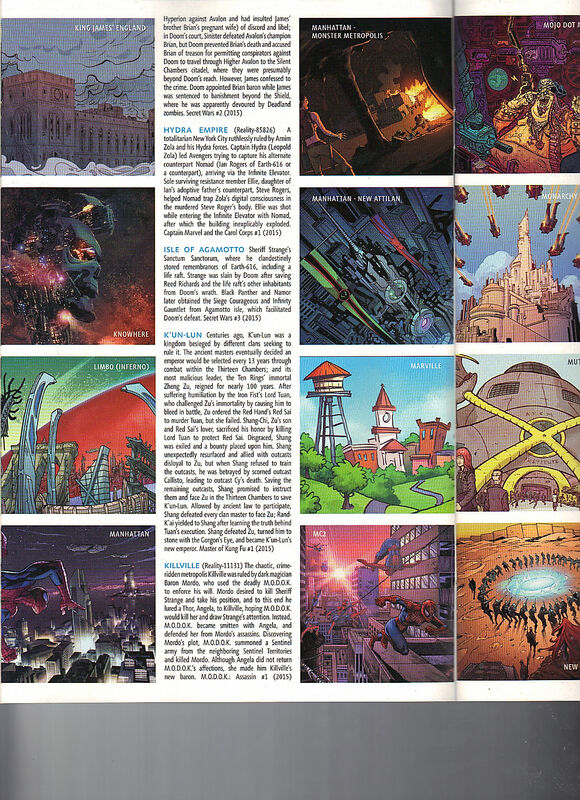 Incursions, always good to know more about what Hickman’s Avengers run was leading up to. 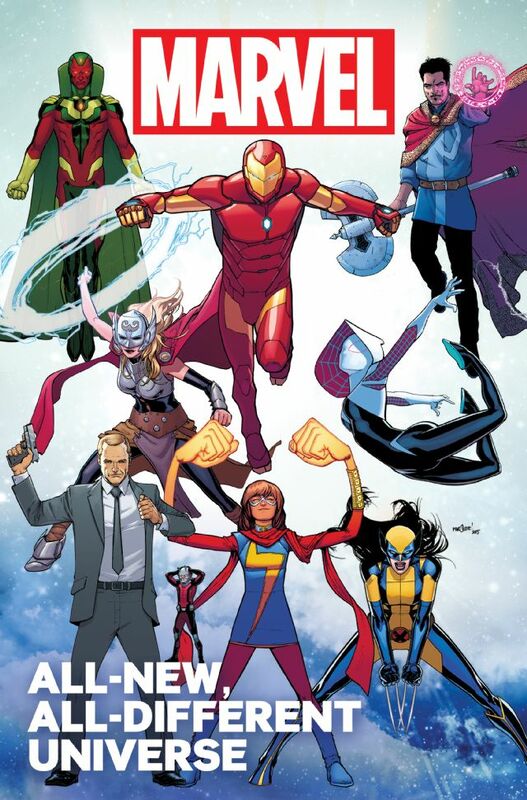 Iron Avengers, from Earth X – always nice when Marvel acknowledges that maxiseries. Maker (Ultimate Reed Richards) had an update, but doesn’t mention Ultimate Kitty Pryde. Not even due to Cataclysm. 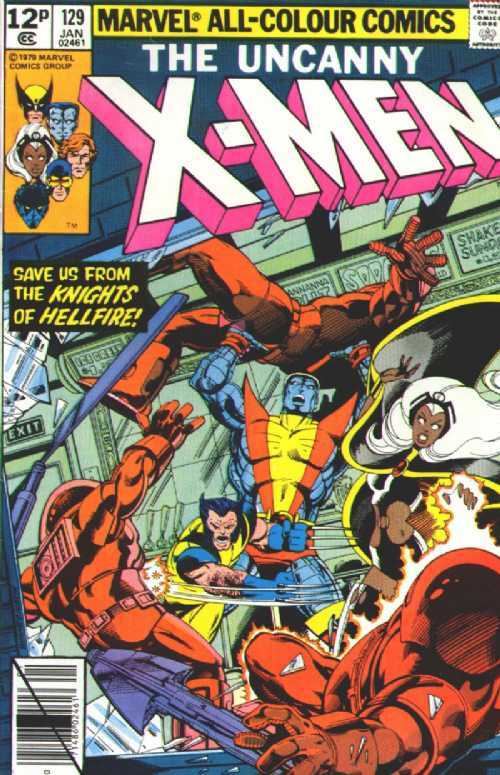 Nightcrawler, but the one from Age of Apocalypse, that was a member of Uncanny X-Force. 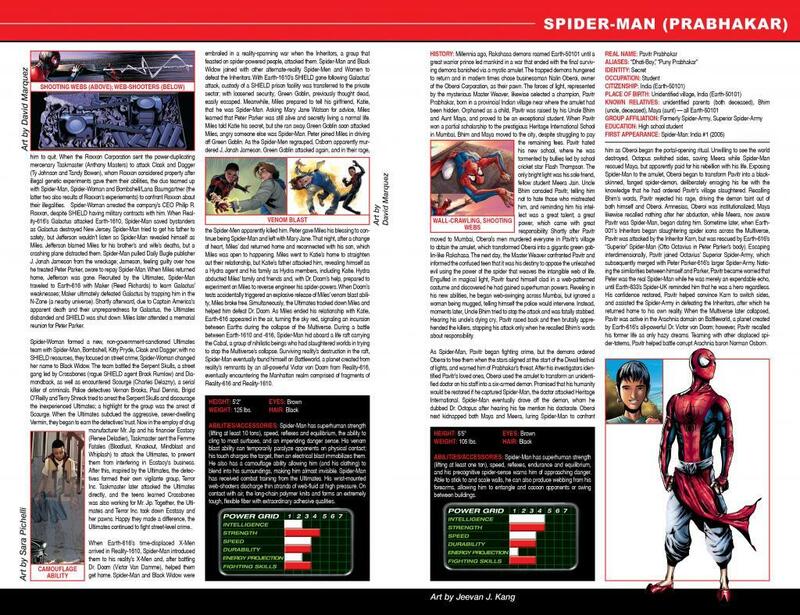 Spider-verse, nice to read what that entire crossover event was about, in three pages. Tyler Stone from Spider-Man 2099, who I read (before) had gotten a complicated twist to his story. Though the entire Stone family is pretty complicated. Throg, that mentions Pet Avengers, all over the place, but Lockheed isn’t named – not even once. Lockjaw is the only member to get name checked. Thunderball, of the Wrecking Crew fame, gets two pages. Volcana, the best aspect of Mocular Man, gets two pages. 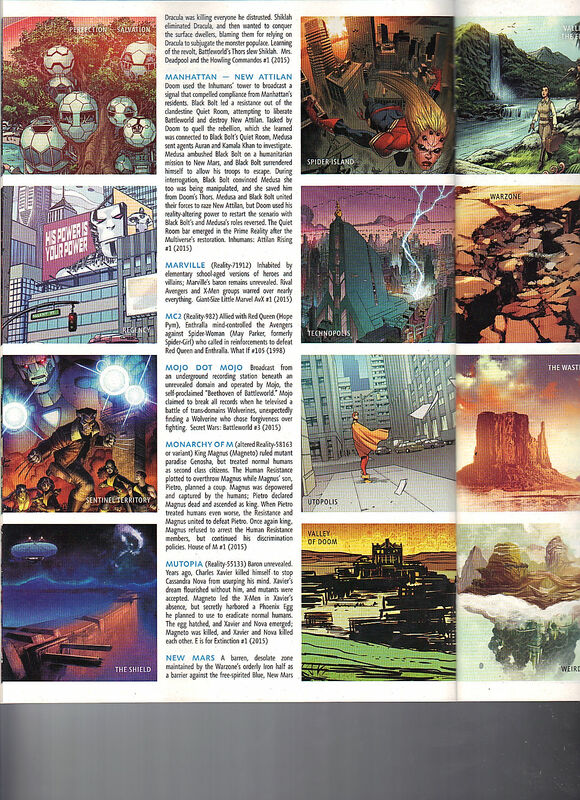 Weirdworld, another domain of Battleworld, the original version, gets three pages. Such a great handbook but I’m a sucker for these.